The Add inventory option allows you to add products to your inventory. When you are buying phones, headphones, chargers and etc, you are purchasing items from a vendor. You can enter this information in the software, and once it is entered you can later sell these items from your inventory. For example, if you're running out of iPhone 5's in your store and you need to re-stock them, you can create a new purchase in CellSmart POS which will add the product to your inventory, and allow you to sell it later. Within the menu, click on the Inventory tab. Then click on the add inventory icon. Select your vendor by clicking on the drop down menu. Enter the Item code/name of the product you are purchasing in the item code field. Enter the quantity(how many) of the product you're purchasing in the quantity field. Click the shopping cart button to add the items to the purchase. You may repeat steps 4-7 to add more products to the purchase. You can click on the Save button to Enter your payment information or the Save and Close button to save and close the purchase and be done. Previous amount: By selecting the previous amount, the balance will not be deducted from the register and will be calculated as a previous transaction. Register amount: You may select this option if you're paying from your register. The balance will be deducted from the register after the purchase has been complete. Terms amount: You may select this option if you want to save the purchase amount towards the vendor. You may review a vendor's terms amount by going into the list of vendors. Click the save button and your purchase will be created. Reference numbers allow you to keep track of the purchases you create in the software. When you purchase items from the vendor, the invoice you receive after purchasing the items can be used to save as a reference. The invoice you receive will contain an invoice number/transaction ID that you can enter as a reference number in the software to keep track of your purchases. For example, if your searching for a purchase in the software and you happen to have its invoice with you, you can enter its invoice number that you saved in the software in the List of purchases to find your purchase in a few clicks. Where to enter the invoice/ transaction number? 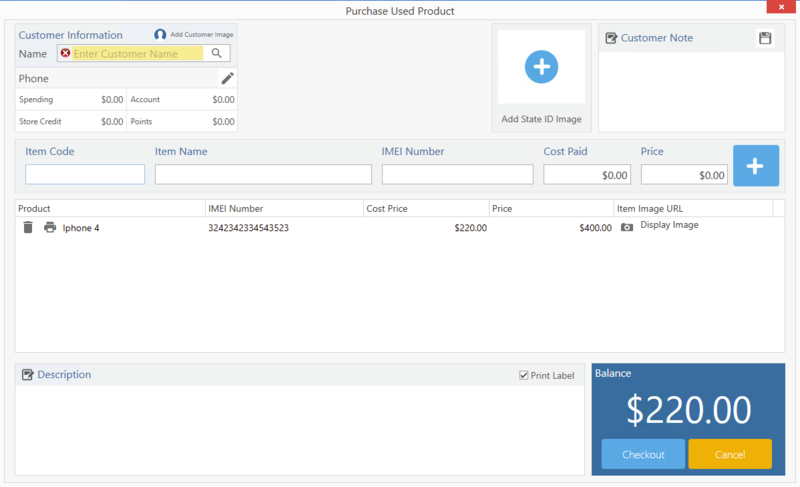 Transaction and/or invoice numbers can be entered in the invoice reference box located at the top right corner while creating a new purchase. You can add a tax or a shipping amount while creating a purchase to keep track. This amount will be considered as an expense in the software. However, you can avoid the expense and split the amount in cost price so all the taxes and shipping amounts are calculated within the purchase. Splitting the value will split the Tax and/or shipping amount within the cost price of the purchase. For example, if you're purchasing a phone and a charger from a vendor and it cost you $40 and $10 and an extra $10 on shipping or taxes you can enter that amount and split the value in cost price which will divide the amount into however many items you have in your purchase. Since we had a phone and a charger inside our purchase, it will divide the $10 we had on shipping based on each product's percentage of the total cost. Therefore, the phone will cost $48 and the charger will cost $12. This will allow you to even-out your purchase based on each product's percentage amount with respect to its total cost. The chart below shows how Splitting the tax/shipping amounts into the cost price will affect the product's price. You can enter any notes regarding the purchase or the vendor in their respective boxes. These notes will not be printed in the transaction receipts but will be saved in the software. By deleting a purchase, the items that were added to your inventory will be removed and if you have purchased the products from your register, a refund will occur and the cash will be refunded. You can edit or view your purchases through the List tab.